Warming, stimulating and toning. In massage blends Ginger Essential Oil helps improve poor circulation, warms cold hands and feet, as well as easing general muscle strains and joint stiffness. It has an affinity with the digestive system where it can be used in massage to settle a wide range of digestive disorders. Ginger Essential Oil is an arterial stimulant, which makes it valuable in skin care to revitalize and bring a glow back to a dull or tired complexion. It is highly effective in relieving nausea and motion sickness, particularly when combined with peppermint essential oil. Inhale a few drops from a tissue, or use these oils in a massage before travelling. 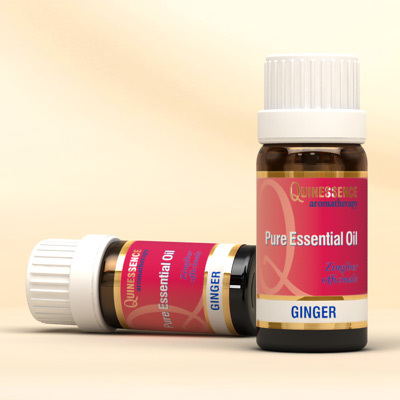 For those who suffer from a lack of confidence, indecision, or a general lack of motivation, Ginger Essential Oil helps bring strength, determination and clarity.